Goncharova and her lifelong companion Mikhail Larionov were among the leading members of the pre-Revolutionary Russian avant-garde. As Mary Chamont has noted, "The decade before the Russian Revolution was one of intense activity in the Moscow art world. Larionov and Goncharova were among the prime movers of this outburst, when young artists were full of new ideas. They met, organized exhibitions of their work, usually financed by some rich merchant, then fell apart with violent quarrels, only to form new combinations with different objectives and other patrons" (Goncharova: Stage Designs and Paintings, 8). Moving from an art that blended Russian folk-motifs with Fauvist colors, Larionov and Goncharova, who eventually married in 1955, were involved in the "Knave of Diamonds Group," "The Donkey's Tail" exhibition of 1912, and the "Target" exhibition of 1913 at which they proclaimed Rayonism, one of the earliest Russian abstract movements. In 1914, Larionov and Goncharova went to Paris with Diaghilev's Ballet Russes. They returned to Russia right before World War I broke out. Larionov served in the army, was wounded, and, after being sent home, he and Goncharova left Russia permanently in 1915, staying in Switzerland briefly before returning to Paris in 1919. Their most productive years were devoted to designing for the Ballet Russes and for Lord Berners. Larionov and Goncharova were the subjects of joint retrospectives in London and Paris before his death; Goncharova has been the subject of a number of exhibitions, including a group show of Russian women avant-garde artists at the Peggy Guggenheim Museum in Venice during the Spring of 1990. For Larionov's drawing of a woman, who looks very much like Goncharova, with a cat, click here. Fifteen of Goncharova's paintings have sold at auction since 2006 for over 1.5 million dollars and held the world record for most expensive work at art sold at auction by a woman artist ($9,647, 480 at Christie's London, 6/24/08) until one of Berthe Morisot's paintings sold recently for over $10,000,000. 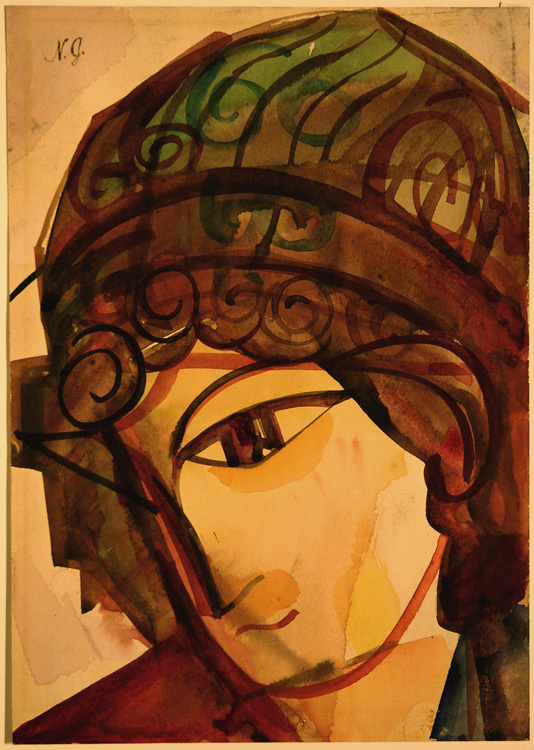 Select Bibliography: Anthony Parton, Goncharova: The Art and Design of Natalia Goncharova (Sussex, UK: Antique Collectors Club, 2010), Anthony Parton, Mikhail Larionov and the Russian Avant-Garde (Princeton: Princeton University Press, 1993); John E. Bowlt, ed., Amazons of the Avant-Garde: Alexandra Exter, Natalia Goncharova, Liubov Popova, Olga Rozanova, Varvara Stepanova, and Nadezhda Udaltsova (NY: Solomon R. Guggenheim Foundation, 2003); Mary Chamont, Goncharova: Stage Designs and Paintings (London: Oresko, 1979); Francois Daulte and Jean Goldman, Larionov / Goncharova (Bruxelles: Musée d'Ixelles, 1976: Texts by the artists and Guillaume Apollinaire); Waldemar George, Larionov (Paris, Bibliotheque des Arts, 1996); Yevgeny Kovtun, Mikhail Larionov 1881 - 1964 (Bournemouth: Parkstone, 1998); Mordechai Omer, Dorit Yifat, & Jane Sharp, Natalia Goncharova - a Pioneer of the Russian Avant-Garde (Tel Aviv Museum of Art, 2000); Yevgenia Petrova, Natalia Goncharova: The Russian Years (Palace Editions with The Academic Council of The State Russian Museum, 2002); Gleb G. Pospelov et al, Natalija Goncharova and Mikhail Larionov (Milan: Fondazione Antonio Mazzotta, 1996); Jane Sharp, Russian Modernism between East and West Natalia Goncharova and the Moscow Avant-Garde (Cambridge: Cambridge University Press, 2006); Arturo Schwartz, Larionov / Goncharova: Mostra collettiva (Milano: Galleria Schwarz, 1961). Classical-Cubist Head. 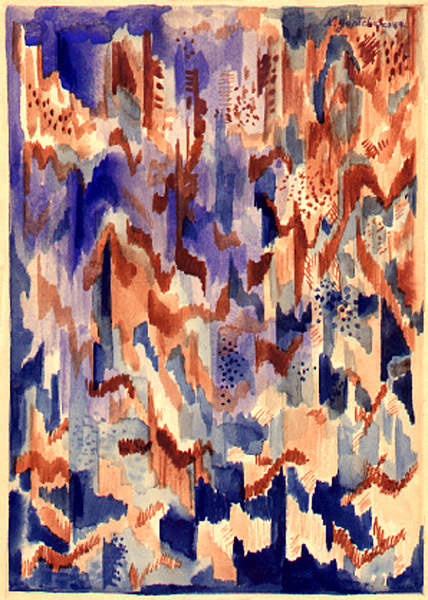 Original watercolor, c. 1915-1917. Initialed upper left within the image with the brush; initialed verso in pencil; colors fresh and rich. Nancy Perloff at the Getty (responding to the drawing as seen on our website) said, "The Goncharova is beautiful, but I wonder about the dating. She did not sign her work in Latin letters until she left Russia (at least to my best knowledge), so the watercolor probably dates to 1915 at the earliest." In this watercolor, Goncharova allows us the choice of seeing the head as a fairly traditional 3/4 view or as a modernist work that offers multiple possible ways of seeing the head including overlapping views composed both of shadows and of colored washes. In the past 2 years, prices for Goncharova's works have risen substantially. 15 of her paintings have sold for over one million doallars since June 2007, reaching $9, 645, 160 at Christie's London 6/24/08 and $9/083,250 In February 2010. Prices of her drawings are strong as well, with a high of $491,400 at Christie's London on 2/4/08 and a backup of $162,221 at Bonham's London on 5/31/07. Our watercolor is a superb work by this very important artist showing her exploration of Parisian modernism. Image size: 270x190mm. Price: $150,000. Abstract Composition. Original watercolor, c. 1913-1914. Signed top right within the image with a brush. Colors fresh. In the past 4 years, prices for Goncharova's works have risen substantially. Over 9 of her paintings have sold for over one million doallars since June 2007, reaching $9,645, 160 at Christie's London 6/24/08 and $8,647, 480 at Christie's London on 6/18/07. Prices of her drawings are strong as well, with a high of $162,221 at Bonham's London on 5/31/07. Image size: 290x205mm. Price: SOLD.